Mrs. Lt. Colonel Ruth Moss was promoted to Glory from the Manor Care Nursing Home in Lynnwood, Washington on Friday, October 13 1995. Ruth Orames was born in Melbourne, Australia and attended school at the Presbyterian Ladies' College in Melbourne. She accompanied her parents, Commissioner and Mrs. Benjamin Orames, to China and completed her general education in Peking. After her father was appointed Territorial Commander of the Salvation Army (Western Territory), Ruth earned her R.N. at San Francisco Children's Hospital in 1935. 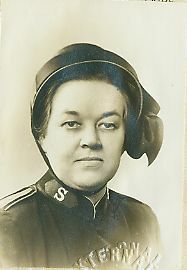 While soldiering at the San Francisco Citadel Corps, Ruth combined her interest in nursing and social work when she entered the Salvation Army School for Officers Training in 1938 ('Enthusiasts' Session). Shortly after her commissioning she became engaged to Lt. Frank Moss. In 1939 Ruth's parents were appointed as Territorial Commander of Canada and the Bermuda Islands. When her mother suffered a stroke that left her an invalid, Ruth transferred to Canada to take care of her. Six months later Frank was transferred to the Cobourg Corps. They were married on October 12, 1940 in Toronto. After several appointments in Canada, Frank went overseas with the Royal Canadian Air Force. Soon after Frank's departure overseas their first son was born and Ruth was on her own for the next four years. Ruth was always willing to meet the needs of other people. She had a keen sense in this regard. At their first corps appointment in Canada, Ruth noticed that a nearby dairy was pouring out milk and arranged for that milk to go to the poor. But this was by no means an isolated event. After her father passed away (June 5, 1954) Frank and Ruth transferred back to the United States Western Territory, Southwest Division, Tucson Corps. In addition to her responsibilities in the Tucson, Arizona Corps, Ruth Moss organized a practical and vital migrant ministry with the local Church Women's Association. Ruth was always looking for ways to serve people that no one else saw. While stationed in Portland, Oregon Ruth saw a need for helping retired people who were walking the streets. She was given the third floor of Divisional Headquarters for this project and with that space began the Rose Center, staffed primarily with volunteers. To be enthusiasts our whole life through. Ruth has faithfully served her Lord and mankind with enthusiasm her whole life through and He has called His faithful servant Home to be with Him.